"This year again was so awesome that words can't express my feelings. The kids were amazingly bright and attentive. You could sense that they knew something different was going on and enjoyed every bit of it. Mrs. Augustave was unbelievable. The way she pushed and expanded her kids' intellect with lesson plans I thought were outside of the kids' scope, was truly amazing. The greatest compliment I can give her is…I am sorry I do not live in the area of her school…it would be an honor for her to teach my child. It was a great experience again…I can't wait until next year." "The Education Fund's Teach-A-Thon is a great way to give back to the community. During tough budget cuts, teachers are pressed to dish out money from their own pockets for basic necessities such as paper, pencils, etc. The Teach-A-Thon gives us a better perspective of what teachers face day-to-day to improve teaching quality and keep children engaged in learning while giving us the opportunity to raise money for a great cause. Teaching kindergarten students about the power of saving money was very rewarding. After each lesson, it was apparent that they have a better understanding of money and the importance of saving at an early age. I am proud to participate in this program. There is a dire need to improve teaching quality in the public school system and by participating, I hope that in some small way I am able to make an impact. You will definitely see me again next year as we continue to help our kids receive the best education and give our teachers the support they need." "Today went super. We were all so happy with the result. The kids were great; we were very happy with our lesson plan and the interactions we had with all 35 kids! The best part was the actual hands-on (no surprise there right?) when we had the kids actually create fresh-cut packages of fruit and vegetables, complete with hair nets and gloves for food safety." "I learned how challenging and satisfying it can be first-hand. I learned that being a teacher is a very difficult job. Although I hear this all the time, I was not aware of the conditions related to space, money, and tools. I also learned how satisfying it can be by seeing the faces and getting their thanks. " "The one word that describes the Teach-A-Thon experience for me is vision, followed closely by insight. Going through the whole experience from materials preparation to teaching has given me great vision and insight into what it's like, and what it takes to be a teacher." "My sisters are teachers so they have been telling me for years what it's REALLY like to teach. Now I learned first-hand how much preparation goes into each and every lesson. There are many public speaking tools that go into teaching; however, you must be able to relate on the students' level rather than usually speaking to your peers. Keeping their attention and making it fun while implementing a great learning experience is quite a challenge! We (team teaching) hope we accomplished our goal that day. We KNOW we had fun and learned what it's like to be a teacher - very rewarding! All the smiles and self-satisfaction they achieve are worth every minute of effort we put into it." "Timidly, I walked into a Kendale Elementary first grade classroom where eighteen little adults were just returning from recess. None too pleased they were, to be pulled away from their fun and games, into a class where an FPL employee was about to speak to them on the importance of being safe around electricity. The children and I quickly began a mutual dialogue that culminated in the children being fully engaged and Mrs. Timmons' encouragement was of tremendous help. This was the first year that I participated in The Education Fund's Teach-A-thon and I plan on continuing my support. Mrs. Timmons and her first graders welcomed mewith open arms and I departed with a depth of gratitude for the dedication of all our Miami-Dade County school teachers." "I am a Teacher Champion and for myself and the rest of our team of Teacher Champions, it was an incredible experience. The students were totally into our presentation and we really got to make a difference. Yes, it was an amazing amount of creativity and work to prepare a class and then pull it off - so I can't imagine what it takes for a teacher to do the same on an everyday basis. It was truly a privilege to participate this year and Whole Foods looks forward to participating again next year or anytime at all." "I always thought that elementary teachers expended a greater amount of energy than do high-school teachers primarily due to the attention they needed to give to each student. I was surprised to find out the same effort is needed in creating a lesson plan for a high-school math class. I had a wonderful experience planning for and spending the day with the high school students at Southridge High School. I was truly impressed by the students' interest level and willingness to continue learning in furthering their education"
"The Burger King Corporation sent two teachers to my class for The Education Fund's Teach-A-Thon. They were fantastic! They involved the students and engaged them in good critical thinking. Thank you very much for allowing me to be a part of this program. The students benefited greatly from their presentation." "My two Teacher Champions, were just that: CHAMPIONS! They worked diligently preparing an exciting lesson for the students. We were able to work together in preparing the materials and making sure the lesson plan met the criteria that would impact student learning. This day could not have been more perfect for my students or myself. 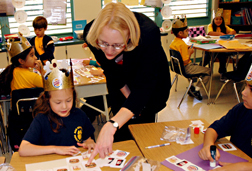 Burger King left the students with "I-Dogs" to remember them, but more than that my students know that Burger King really cares about their education. Thank you for a wonderful experience!" "The experience was fantastic! My teacher champions, Fiolina Burnett and Mark Guidroz, were awesome. They really engaged the students with their hands-on activities. They were very patient and gave positive reinforcement to the students who really need the extra push to succeed. Thank you and I hope they will partner with me again next year." "Thanks to Nancy Mulshine and Cristina Aguilar for taking their time to prepare a lesson and actually coming out to our school and teaching our students. From them, the students saw role models and learned what it really means to give back to their communities. They gave our students something valuable they can hold on to and use their entire lifetime: etiquette and service." "I have been trying to incorporate real life experiences for my students, so they can incorporate them into writing projects. Our cooperative lesson from Mr. Stewart has helped me to accomplish this ever-challenging task. My students will cherish their visit with Sean. The entire Carol City Elementary School staff will always welcome The Education Fund and FPL, with open arms. We are happy that both companies share our desire to prepare students for a diverse future. 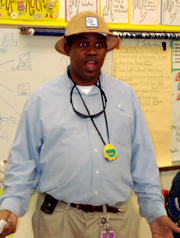 I look forward to inviting FPL back to Carol City Elementary School to participate in future learning events." "The school I work at is in a poverty zone, and the parents of the children that are in my class cannot afford uniforms which are required to be worn at the school. They are not in a special club; they are required as mandatory attire. I decided the best thing that I could give to all my children would be something that they could not get on their own. I therefore decided to order uniform shirts for all of my students. The day that the uniforms came in was the day of a special field trip that the entire first grade went on, which was to the Homestead Rodeo. All the children in my class had brand new matching uniforms, and we took pictures of the entire class with the principal of the school, Dr. Nebb. The children really appreciated the new uniforms, and it was at that point that I knew I made the right decision by using the money raised from the Teach-A-Thon to get these uniforms. I thank you for the opportunity to work with The Education Fund and look forward to doing more work with you in the future." "I just wanted to take this opportunity to tell you what a huge success my day was with my CHAMPIONS. They really were champions. Jeff and Paul from Coastal did an outstanding job! We decided from the beginning that it would be best to do hands-on projects that have been needed to get done for some time in my Agriscience area. There was either a lack of funds or know-how on my part. They were able to accomplish everything we talked about. I kept telling them that I felt like I was part of Extreme Home Makeovers. They were able to bring in a landscape crew, an electrician, a plumber, an irrigation specialist, and all of the heavy equipment necessary to get the jobs done. I had an issue with the sink in the greenhouse. They addressed that. I have a weather data collection device that I was having to carry outside each day in order to get any weather readings. It should have been attached to the building 5 years ago. They took care of that. We had several areas that needed to be re-landscaped. They took care of that. They even arranged for us to get a new irrigation timer to handle all of the new sprinklers that were installed. We started at 8:00 a.m. and didn't stop until 4:00 p.m. It was a day that I will never forget! What a great experience for the students. Thank you for allowing me to take part in this program again." "This entire project has been wonderful! Not only did my class and I get to meet two wonderful and creative people, Javid and Andy from the Orange Clothing Company, we were exposed to a wonderful lesson, and we also received much needed funds for the classroom. I want to compliment you and your organization for being so caring, as well as professional. I hope you will include me in this program for the future. I will try to help in any way that I can. "